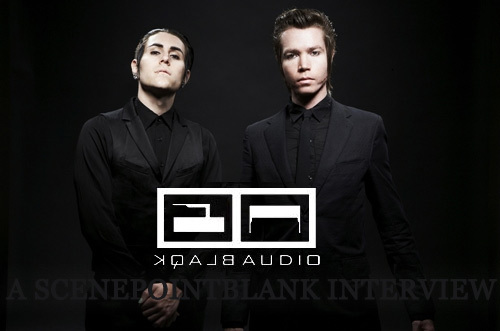 Born out of a shared loved for electronic music, Blaqk Audio represents the endless passion that Davey Havok and Jade Puget have to create music. Scene Point Blank recently spoke with Puget about what precipitated the release CexCells and what he and Havok hope to achieve with their latest musical venture. Scene Point Blank: The first interview I actually did was with Adam, of your other band, back in 2003. Since that time there have obviously been a lot of changes in your life. I was wondering if you could tell me a little about those changes and if the success of A.F.I. is what facilitated this release of Blaqk Audio? Jade Puget: Yeah. I think even if we hadn't of had the success of the last two records, we've loved electronic music since we were young. Really in 2002 is when we started talking about doing this, so I think regardless of how A.F.I. would have done we would have done this record because it was something we really wanted to do. As far as how our lives have changed. There are certain physical external changes that have taken place, but I don't really see myself as being any different from back before Sing the Sorrow came out. The things I'm doing, and the reasons I'm making music are the same. Scene Point Blank: Aside from being an electronic outlet for your eclectic music tastes, what are your intentions in doing this band? Do you see this more as an art project, or music to make people dance to? Jade Puget: Really, with the idea of this project we had no intentions. As I said, we've loved this type of music since we were kids; I love to program, and it's an extension of that. We thought, "We'll put out a record and people might like it, people might not like it, people might not buy it." But that's fine. It's kind of something for ourselves, you know? People dancing is a definite positive byproduct. It's such a different vibe from A.F.I. shows. A.F.I. shows are very serious and dark, and when we play with Blaqk Audio people are moving and it's a fun vibe that we're not really use to. Scene Point Blank: Speaking of the crowd reaction, I had read in a previous interview that Hunter and Adam are attending, or have been in attendance to some of your shows. What have their impressions been like? Jade Puget: Adam came to the first show in San Francisco and Hunter is coming to the one in L.A. which actually won't happen for another couple of weeks. But Adam texted me after it, and he really enjoys the record so he was stoked. He mentioned that it was really weird seeing Davey and I from the front and not looking at our asses. He's really use to seeing the back of us for an hour, so that was something new. Scene Point Blank: CexCells debuted at number 18 on the Billboard chart to the surprise of a lot of people, considering that this is a side project, but also to many an unknown band. Do you feel as if the album's success has been piggybacked on the fans of A.F.I. even with Blaqk Audio as a separate entity? Jade Puget: Though musically and lyrically it is separate, we certainly know that a lot of A.F.I. fans bought the record, and without them we wouldn't have sold as many records as we did. There have also been a lot of people who have approached us and said that they don't really listen to A.F.I. or don't even particularly like A.F.I., but they're really into this because it's their type of music. Initially it was mainly A.F.I. fans that knew about this but now that it's been out there a little bit, I think other people that don't even listen to A.F.I. have been getting into it. Scene Point Blank: You had mentioned the music being different lyrically. When comparing and contrasting albums with your other band to this, the biggest difference, to me even more so than the music, is the sexual content. Perhaps this is a better question for Davey, but where did this come from? Was it just a reaction to the sound? Jade Puget: Luckily because I've done a lot of interviews with Davey I know what his answer is to this. Lyrically I think a lot of people were surprised because A.F.I. has six records (Editors Note: A.F.I. actually has seven records) and there has never been any sexual content, or at least that has never been the focus of any of the lyrics. It is based on the music. Dance music inherently is, sort of, a sexual music; that whole scene is sort of a sexualized scene. Davey's been within the industrial and dance crowd for years now so when he started writing lyrics it was just natural. There were no plans to write a sexually charged record, but after writing a few songs he was just like, "Whoa this is what came out." Scene Point Blank: Do you feel you have to sell yourselves a little more being a new band? Jade Puget: No not really, because like I said this is something we did for the love of the music. We never thought we'd just do this other thing to sell a bunch of records or to do a big tour. We didn't desire that and that wasn't the goal at all. We've done press certainly but we're not trying to sell ourselves in any way. In fact I kind of try and shy away from that in terms of really going out there and doing something kind of questionable to promote this record, because that's not what this record is about. Scene Point Blank: You filmed the "Stiff Kittens" video a month or so back now, when are we expecting to see it? Jade Puget: No one's seen it yet actually. (laughs) I think because there are special effects in it it's taking a long time. I actually just got an email yesterday saying we're suppose to have it by Monday. We did it with Mark Webb, who we've done a bunch of videos with. There was no money so he was really nice and shot it in the basement of his house, and had all the people running through his house, which I never would have wanted to do. It was really cool of him to do that because since the first time we worked with him on "Days of the Phoenix" he's gone on to become a really big director. I think he was off to shoot a JLO video after us and so it was really just kind of a favor. Scene Point Blank: In addition to having the "Stiff Kittens" video soon to be released, you have that little video on your Myspace for a song that is not on the album. Is the mix media aspect something you're interested in? ade Puget: Yeah. Usually with our shows we have big screens behind us with a bunch of different media and clips playing. The guy who does it, who actually does A.F.I. too, is from England and he couldn't get into Canada. Well, he could, but if he did he couldn't get back into the States. So, unfortunately for these two shows (Editors Note: referring to the Toronto and Montreal shows) we weren't able to have that. I really like that little video clip, though. In fact I have another piece of unreleased music that I want to do another video like that to. The way things go with the Internet there are so many more avenues to putting stuff like that out there, and it's kind of fun. Scene Point Blank: For my own interests sake, there was a clip from "The Fountain" in there, right? Jade Puget: Yes. Good job! There were some various clips in there, some of them weren't from movies, but that's the first time I've heard someone actually recognize one of the clips. Scene Point Blank: When A.F.I. won the Moon Man at the MTV Awards it was presented by Lou Reed. The reaction from the band in meeting him was an interesting and amazing thing to watch. Lately I've been seeing similar reactions from fans to meeting yourself. Does the idea of being a notable cult figure ever occur to you? Jade Puget: We don't really consider that. When I meet people today I still feel the same way that I did when I joined A.F.I. in 1999, and that was eight years ago. It doesn't seem like I'm some bigger than life person. I still think of us as that little band that some people listen to, like when Black Sails in the Sunset came out. To some people, since we've been around fifteen years now, and some people who listen to us were just born fifteen years ago, we could be that musical presence that's been around your whole life. I guess that's possible, maybe, and I mean that's very flattering. Scene Point Blank: Thanks for taking the time to do this. Any closing comments? Jade Puget: If people are interested in Blaqk Audio, and maybe experiencing electronic music for the first time I encourage them to go out and check out a lot of other bands that are doing it in the underground. There is some cool stuff that people might be interested in if they dig around a bit. Posted Jan. 20, 2019, 2:39 p.m.
Posted Feb. 26, 2013, 8:17 p.m.
Posted June 12, 2012, 4:28 a.m.